A milestone is defined by the PMBOK Guide (5th Edition) as “a significant point or event in a project” (pg. 546). Typically, milestones signal the completion of a key deliverable but they may also signify an important decision point in a project. 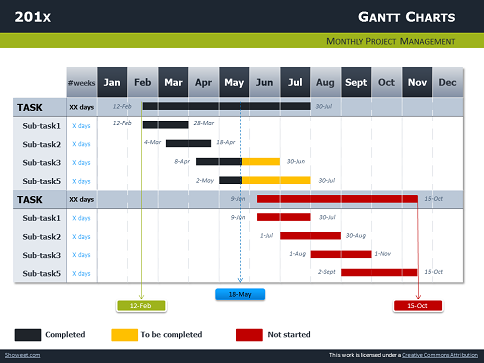 A summary of milestones identifying key deliverables/sub-deliverables and estimated dates for their completion was listed in the project charter. You may have identified additional milestones while developing the work breakdown structure (WBS) and WBS dictionary. As you begin to develop the project time management plan, you should consolidate these milestones into a milestone list. A project milestone should be defined as the end of a project stage and marks the completion of that phase. Milestones can be used not just to highlight that key deliverables have been delivered, but also to indicate a key decision (or key investment) point within the project. Milestones can be used in any project, be they a construction project, an agile software project (milestone does not mean waterfall), or a project to build the next generation of space shuttle. Phrased around a specific outcome rather than a set of activities. Measurable – some part of the milestones should be a statement of the evidence that the milestone has been reached. Used to indicate important decision points or achievements on the way to the overall project objective. Milestones should consist of a “statement of achievement” that describes what has been accomplished and a “acceptance criteria” that identifies the criteria that determine whether the deliverable is acceptable. Milestones are typically written in the past tense to identify them as being different from the activities for the project. This template (Milestone List) can be used to list the milestones for your project. In addition to referring to the list of milestones in the project charter, you should review the Work Breakdown structure (WBS) to determine if changes or additions must be made to the milestones list. Notice that each of these milestones is written in the past tense and describes the deliverable or sub-deliverable.